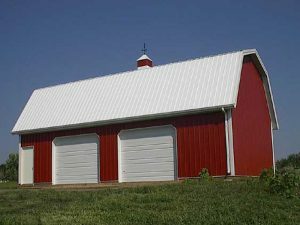 Pole barns, also known as post frame or metal frame buildings, meet a variety of needs. 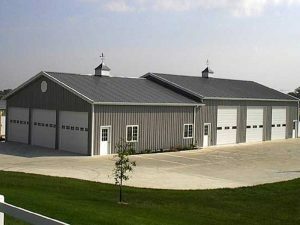 From office spaces to horse arenas, from garages and shops to machines sheds, Dutch Mill Supply has designed and constructed high-quality metal pole barn-type buildings that stand the test of time. We pride ourselves on working face to face with customers to create a plan that best fits their needs. 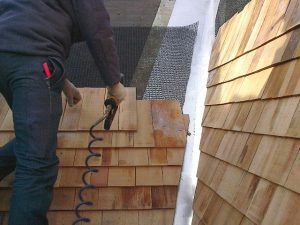 We are also willing to design buildings and purchase materials for on-site construction by outside contractors. If interior finishing is needed, we provide that as well. 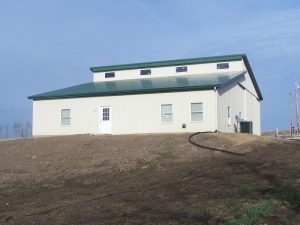 When scheduling your metal post frame building construction project, we recommend you plan with us three months ahead of time. We’ll work with you to ensure all the details are in order so that everything is ready to go by your project launch date. Our turnaround time once construction starts is usually eight weeks or less, weather permitting. Looking for color options? Visit our supplier’s website. Check out our online portfolio of our work.